Essentialism is a book you read when you feel you need it. For me, that was in 2016. It was at a point in time where I felt a great need for focus. Trivialities and straddled half-measures were taking too much time, in work and at home, and all the effort with little output made me feel useless. The condition, I’ve come to understand, is something we call “busy”. I was quite “busy” in 2016. This book helped put me on the road to recovery. The best part of this concept is the notion that you must determine your highest point of contribution and make what you do, through that channel, an easy and immediate thing. But what, pray tell, is your highest point of contribution? It’s a very hard question to answer. It’s also the only thing that prevents this book from being a “perfect 10” for me because there isn’t nearly enough on this very point. “Our investment strategy borders on lethargy”. Pick a few good companies, invest heavily, say no to the rest. This is a simple description of Berkshire Hathaway’s “lethargic” strategy but replace the word “companies” with “projects” or “endeavors” and you can apply this Essentialist idea to anything. But if you say no to the rest, doesn’t that mean you miss out on opportunities? Am I overreading this? Or is it really just that simple? I think it’s really just that simple. If you choose to get waffles, you have also chosen to not get pancakes. Got it. The difficulty with this comes in the second and third level of decisions that cascade from the first. It’s not the trade-offs of your first decision that matter. Those feel obvious. It’s the cascading trade-offs that are, or aren’t, accepted afterward. Consider Netflix. They sent you DVDs in the mail. Then they switched to streaming. Both have trade-offs but which path is the most essential? Which allows you to deliver at the highest point of contribution? A person or a company goes along one path, with one set of trade-offs, and then sees a new path and essentially discards everything they had done to accept a new decision with what are expected to be lesser trade-offs. This is called a “pivot” and the absolute most important aspect of a pivot is that you leave your old path behind. If you don’t leave your old path, you essentially maintain one foot in one direction and the other foot pointing the other way. This results in the “straddle”, a concept Michael Porter coined to describe companies that try to do multiple divergent things at once. McKeown illustrates with the example of Southwest Airlines and its competitors. It worked almost immediately. To such a degree that many airlines started to emulate the strategy. Partially. Continental Airlines began to run certain aspects of its service in the Southwest style but the partial step created operational nightmares and an identity crisis of sorts. What are they? A standard airline? A deluxe airline? A budget airline a’la Southwest? We’re all three, they would say, which invariably meant they were none. Millions were lost in their bid to compete because they only took the half-steps while Southwest was already well on its way to forging a new corner of the market. Essentialism, then, is about fuller commitment to fewer things. The trade-offs can feel expensive but the avoidance of trade-offs carry a higher price. Continental is one of many companies to face such traps. “Job-work”. A fascinating description. It does seem like our jobs are often designed to serve a turn here or there instead of driving towards your main design. Anyway, how does one eliminate the clutter of too many tasks straddled across too many directions? One way is to consider the endowment effect. We endow special value to things we own. A coffee mug we buy for $5 will now cost $7 for anyone else to buy it from us. This is sensible in some ways if you wish to make a profit somehow or if this happens to be the only coffee mug you own. But the endowment effect fuels so much of our hoarding. Not only hoarding of physical things but the non-physical stuff too. I overvalue stuff that no one else cares about and I honestly don’t know why. “If you didn’t have this task or project already, how much would you work to try to obtain it?” Many of us ambitious, high performer types look to grab everything we can. It’s a desire for control, prestige, advancement, or perhaps a battle against our insecurities. We can’t do it all and yet we want to so badly until it’s month seven for all those projects and nothing makes sense anymore. Once acquired, these projects or jobs or tasks never feel as worthy. The pursuit of new stuff to do allows us to avoid the stuff we’re already doing. It’s novelty. The psychology applies at all sorts of levels. I suspect Continental straddled against Southwest because they felt a little bored with their current strategy and wanted something new. Just not completely new. A final concept from the book that’s worth considering: the reverse pilot. I really love this idea and am convinced that it would yield massive insights in the workplace. What is it exactly? The reverse pilot is a technique used to fly airplanes backwards. Jokes aside, the reverse pilot is a test to see what happens if you REMOVE an initiative or activity. So often, our pilot projects are a test to see what happens if we start something new. The reverse is to see what happens when we stop something old. Something we’ve always done. An honest reverse pilot will probably yield an 80/20 result that tells us we’re just wasting time of everything. It’s as if the movie “Office Space” could be validated in this one exercise. Who has the courage to do a reverse pilot? Who has the courage to stop being “busy” for a minute and see what matters and what doesn’t? An Essentialist will have an eye for waste and unimportance. They will cut and redline like a good editor. Why? Because removing the fluff enhances what remains. In the words of Dieter Rams, it allows us to find the state of our design that gives us “Less but better”. A reverse pilot leaves you with the vital 20%. It’s less but better. For everyone. Consider this website that I stubbornly call a service. I use the term because a service will modify itself for the user whereas a blog will modify itself for the author. This service currently strives to produce content five days a week. Four posts are small bits on a singular concept. One post is a book review. It’s a lot for one person to do and I’m quite certain that a lot of it is completely unessential. But what should I do? It would be absurd to cut things indiscriminately. So I’m spending six weeks developing the content. I’ll then reassess on a number of criteria to decide what the next six weeks will be. It’s part experiment, part search. A search for what my highest point of contribution can be. This is a pilot. It leads to a reverse pilot. An 80/20 analysis. Elimination. Pivots. You get the idea. The ideal end-state is a service that produces regular useful information with as little waste as possible. It will likely take five years to get remotely close to that goal. And what’s essential, within that time horizon, will likely change from one six-week period to the next. The point, ultimately, is that Essentialism is an active practice. Because the things that are essential change from time to time. It isn’t a static philosophy one uses to posit their thoughts. It’s a discipline that is used every day. You should be warned, though. This practice will create a tiresome paranoia. I often look around and think of all the things that are completely unnecessary and it plunges me into a nihilistic race to the bottom. I’M GOING TO GET RID OF EVERYTHING. John Maxwell is right. Practically everything is unimportant in a detached, objective, life-goes-on sort of way. Importance is a choice. Meaning is what we make it. There’s much more to the book than this. The section on mission statements is worth three times the price of the book. I really appreciate that McKeown tees off on this absurd practice. More on that in future posts. It’s a fantastic work that everyone can benefit from. Buy it on Amazon. 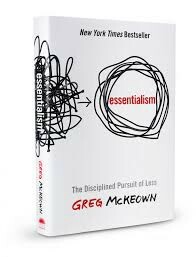 Essentialism is a disciplined, systematic approach for determining where our highest point of contribution lies, then making execution of those things almost effortless. A counter to the endowment effect — If I didn’t already own this, how much would I spend to buy it? Choose choice in every area of your life. Optionality produces upside risk. A strategic position is not sustainable unless there are trade-offs with other positions. The faintest pencil is better than the strongest memory. The reverse pilot: test whether REMOVING an initiative or activity will have any negative consequences. We can’t know what obstacles to remove until we are clear on the desired outcome. Originally published at strivingstrategically.com on August 24, 2018.